Jessica and Strategic Practice Solutions came to our rescue when my chairside assistant of 23 years was suddenly no longer able to assist. 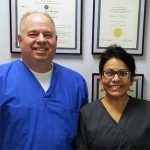 Over several months Jessica and Strategic Practice Solutions were always able to meet our needs and filled the dental assistant position with an experienced professional. When it was evident that we needed a permanent replacement, once again Jessica and SPS made the transition of one of the temps, Carlota, to a new employee we are all so happy with. I would recommend SPS for all your dental personnel needs. Thanks Jessica and SPS!!! Thank you Jessica and SPS for finding me my new home!!! I am so happy. I really see myself here long-term. I love knowing I have this amazing place to go to everyday with the support of a great Dr and Staff, my new family!!! I Prayed for this, SPS helped assist me in finding it. My name is Dr David Renaud, our office was short staffed for quite some time and we were having a difficult time finding qualified candidates. In addition, we were in need of some office systems to be reviewed. Strategic Practice Solutions just so happened to come our way when they were conducting an employment reference check on a candidate they had in mind for another client of there’s and called us regarding the performance of a former employee. We were impressed at the diligence in how they executed the employment check that we asked for their assistance in locating a front desk person for our office. We have found SPS’s recruiting and permanent staffing services to be very systematic and we could definitely tell they were looking to fin d the right fit and not just to place a body. We have engaged in 1 permanent hire and have asked for SPS to assist us with a second perm hire. In addition, to staffing we have contracted with Tricia to observe our day to day operations for a few hours- which in my opinion a lot of other consulting firms will not engage in for they are in it for a larger contract. We found Tricia’s feedback after her visit to be of a tremendous help and assisted us to identify the strengths of various employees and what roles they should have at the front desk. The coaching sessions have provided us with insight to assist us in making educated and calculated business decisions. I have been in the dental field for over 30 years and I whenever I thought I found my forever career office, something occurs; doctors retire or the office gets bought over and etc. I have known Tricia thru SPS and never thought about going thru them for a job position, until one day I said I am going to give them a try. That was the best decision I have ever made in my life and career. The office goes thru a review process with you, like consulting, training and coaching. You NEVER feel alone when your with SPS. You become apart of their family. They make sure you find what you are looking for. They leave the decision up to you. There are no surprises, everything is clear and in writing. Plus, when you finally find the position in the office they recommended, they are always still there for you to make sure there are no problems and smooth sailing. Without them I would have never found Dr. David Renaud and his staff. I have two more families in my life SPS and My new job family. Thank you isn’t enough for what you did for me. Greetings! I am a dental hygienist, redesigning my professional career. Strategic Practice Solutions has become the engine that allows me to provide care in MI from May thru December. We are then able to reside in AZ From January thru April where I practice there. It’s a great life! Human Trafficking has become a CE requirement for our MI license renewal. In May of this year, I attended a “Women At Risk ” seminar to meet this requirement provided by SPS. It was a very moving and enlightening presentation given by Rebecca McDonald, president and founder of WAR. Learning how dental professionals can identify these individuals and potentially be part of the team that rescues them is rewarding. I am honored to be a part of Tricia and Jessica’s SPS team. They are always available, appreciative, and effective in meeting their clients needs through us! We have worked with Strategic Practice Solutions for the past 20 years. We have hired permanent front desk managers, assistants, and hygienist. We also use the temporary services whenever one of our team takes a vacation. Strategic always comes through for us, even when a last minute call is placed for help. They have sent us very qualified and professional employees. Strategic is the first number we call when any type of dental employee services are needed. We don’t have to go through the hassle of investigating the new hires prior employment, because they take care of it all. They are a great company. They take great care of us. Great experience with Strategic Practice Solutions! I needed a job asap and they were great! They scheduled me as much as I could handle working with the intention of finding me a permanent position. I loved how I was able to try out, so to say one of the permanent positions BEFORE accepting. Trish really looked out for me as far as what I was looking for. The whole process was a breeze as she was my middle man. I accepted a permanent position from one of the assignments. The process didn’t stop there, Trish has contacted me twice to see how things are going. She really makes sure her hires are happy and everything is going smooth. She’s there for you! Jessica is great also as she made sure I was working! They both are very professional and make sure all is well AFTER permanent hire. Great company! If you are looking for a company that finds you jobs, handles all the arrangements as far a pay , and checks on you long after you are hired, than Strategic Staffing is for you! Wish I had went though them years ago! Tricia is GREAT! I had moved from out of state and was looking for employment in the dental field. I met Tricia with SPS through a professional friend. I loved her kind and patient personality! She gave me tons of options and avenues to some great opportunities! With expertise and knowledge, she had set up a temp position in an office that was looking to hire a full time assistant. I was able to temp in that office for 6 weeks. That gave me plenty of time to see what the dentist and staff’s expectations I would need to meet if I were to be offered the postition. Tricia and I talked constantly over the weeks and I was offererd the job shortly after. She went through all hoops to reassure the dentist and staff of my qualifications and level of professionalism. She also went to bat for my hourly rate! Thanks to Tricia and SPS…..I love my job! They helped us with our staffing needs and are providing coaching to help with better office flow. Very helpful in teaching new skills and getting everyone on the team calibrated. Great place to start your future careers. I was faced with being out of the Hygiene Field for awhile and couldn’t find one full time office, so I decided to give temping a try. I met Jessica & Tricia through their website, Jessica was the first person I talked to and she was amazing! I went in for an interview and after meeting both of them, I knew instantly it would be an amazing experience. Jessica and Tricia are very knowledgeable, personable, professional and passionate about the dental field. I have been working for Strategic Practice as a Hygienist for ten months they keep me very busy. I have gained lots of experience working in many offices with many different types of personalities. Tricia and Jessica are Amazing to work for! I truly feel appreciated and am grateful to be part of such a wonderful team. I can honestly say because of Jessica and Tricia I LOVE doing hygiene again and enjoy going to work. I look forward to working for Strategic Practice Solutions for many years to come. SPS did a terrific job “matching” our new manager to my practice. I got the type of manager I needed (self-motivated and very knowledgeable) and she got the Boss/Job she wanted (Boss who lets her do her job w/o interference.). We are BOTH highly satisfied with the results.